Lucious Lupine | Faddegon's Nursery, Inc.
Apr 18, 2016 | Perennials, What's New? 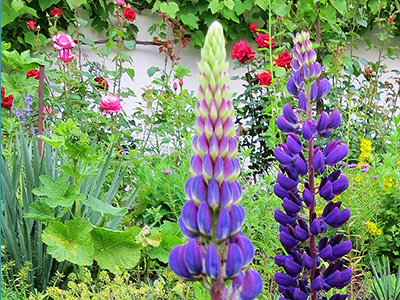 Pronounced either lupine or lupin (both are correct), this perennial flower produces spires of blue in the late spring or early summer depending on the cultivar. Lupine is known as one of the most traditional cottage garden flowers. Interestingly, because of its strong vertical form, it also adds just the right note to the formal garden as well. Lupine is the perfect garden flower for attracting pollinators such as butterflies and hummingbirds! Although blue is the most often recognized color for lupines, other colors such as pink, white and yellow are also available. One of the most popular varieties of lupine is ‘The Governor’, an award winner, with scented blooms of dark blue and ivory. ‘The Governor’ reaches 2-3′ of which 10-12″ is made up of blooms. Another desirable variety is ‘Gallery Blue’, a dwarf version topping out at 18-24″ in beautiful shades of blue. Provide it with plenty of sun and an area with deep, rich, moist, well-drained soil. Use them in a bed or an area where they can be naturalized, because they’ll look great anywhere in your landscape! Perfect addition for a cutting garden too!